One of the greatest problems concerning the watercolourist is that of reserving whites in a painting. There are several ways of tackling this: the use of the negative painting technique, masking fluid or film, scratching with a knife or scalpel, or the use of Chinese white, white gouache or acrylic. Pulling out colour with a damp brush or tissue, or sponging out when the wash is dry, are further ways of achieving a considerable lightening of the tone, although these latter methods rarely are as glaringly white as the aforementioned ones. Down the centuries white body colour has been employed, the equivalent of our white gouache or Chinese white. These days even the main watercolour societies feature paintings carried out with much use of white gouache or acrylic paint, so there is no stigma attached to using that method, and I shall illustrate it in a future blog. Scratching can be effective for minor features such as ropes or rigging in a harbour, limited sparkle on water, and similar items, but for larger or more intricate work masking fluid or the negative painting technique is a better method. 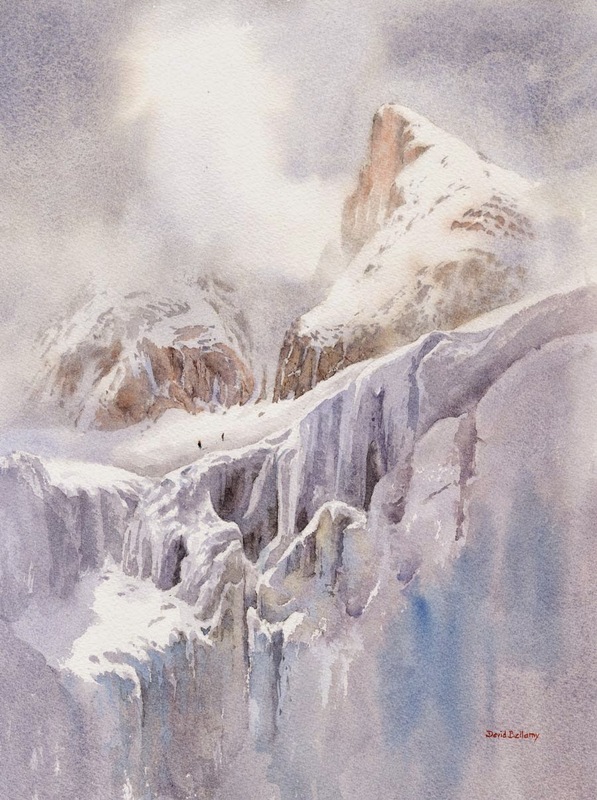 In the watercolour on the right I applied masking fluid over the actual icefall with all its complexities, in the positions where you see the absolute white. This, of course, is the naked paper after the masking fluid has been removed near the end of the painting. For the snow lying on the peak and crags, and also for the light cloud, I used the negative painting method, that is, I worked round the white shapes with the darker sky, the rocks and shadow areas. When it was all dry I applied further shadow washes using French ultramarine and cadmium red over some of the snow and rock areas that were in shadow. I could have employed masking fluid to some of these parts, but it results in hard edges and much of the edges there I wanted to appear soft, especially the light cloud. I find it best not to mix the two techniques in the same area as it can get confusing, thus causing errors, so I have deliberately kept the top and bottom halves of the composition apart in that sense. This entry was posted in atmosphere, David Bellamy, Mountain Painting Scale Figures Composition, mountains in watercolor, Painting ice reflections in watercolor, Painting snow in atmosphere, Uncategorized, Watercolor mountains landscapes by David Bellamy. Bookmark the permalink. Thank you for the excellent description of these techniques illustrated in your beautiful painting which shows how very effective they are …. invaluable advice, stored away in the brain for future use !